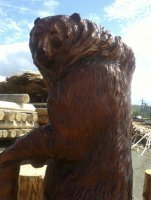 The national symbol of the Russian people, the bear, has long been embodied in wooden sculpture. The owner of the forest is made by hand, so carved wooden bears have their own individuality. 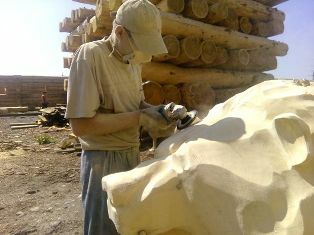 The sculptor in wood in the company Medveazhy log - good houses of cedar, Roman Mazhayev puts a lot of effort, putting his soul into this hard work. You will not find two completely identical figures. Any idea, embodied in a tree, gives a special style and charm to the surrounding interior. 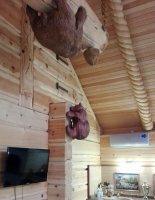 Thinking through the design of the hotel or hunting lodge, add a national flavor that can emphasize a carved bear made of wood. 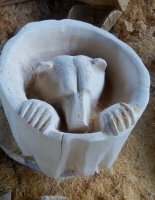 Lovers of bathing procedures will enjoy the wooden sculpture of a bear standing in the relaxation room or at the entrance to the bath. in the form of prop pillars. The project of the future sculpture is first drawn on paper and agreed with the customer. If necessary, add or remove some items. You can choose the wood type and color of the coating. Pay attention to the section "carved wood bear photo". Having a great experience in making figures, we collected a collection of our works. You can learn something interesting for yourself, since fantasy can be limitless. the complexity of drawing the details of the structure of the bear. We will say the exact cost after a little clarification after a phone call. Typically, the cost consists of three components - the size of the log for sculpture, the cost of work and delivery. 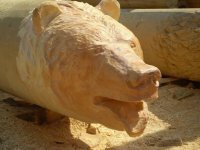 To understand the price order - a carved bear with a height of 2 meter, made of jealous 60-70 diameter, see will cost in Moscow and the region about 70 000 rubles. 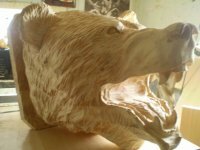 If you like a carved bear made of wood, it will not be difficult to buy it. An experienced master bring your ideas to life.